I made a bet with a friend about what month was warmest in San Francisco. And, I lost the bet based on monthly averages. But maybe there was another way I could have won. Maybe at noon January was warmer than June? Or at 6pm, when I'd most likely be outside? Or maybe cloudiness distorted my perception? So, as anyone would do, I downloaded daily and hourly data from NOAA on temperature, cloudiness, wind chill, heat index, and wind speeds for 25 cities in the United States. My first attempt using a heatmap, ironically, wasn't very effective. My second attempt, "Weather Lines", used a more typical line chart with one line for each of the 24 hours of the day, with day of the year on the x-axis and percent cloudiness on the y-axis. That said, we experience weather during the course of a day, so I wanted a visualization that tied more closely to that daily experience. In my third variation, "Weather Circles" I used a circular layout. This has 365 "circles", with one line for each day of the year. Each "circle" is actually a 24-gon, with one point for each hour of the day. The metric, cloudiness or temperature, is shown as distance from the center for each point of the 24-gon. I found that the line variation is easier to interpret quickly, but the 24-gon view is enjoyable and opens up the opportunity for a different set of insights. This visualization has 24 lines, one for each hour of the day. 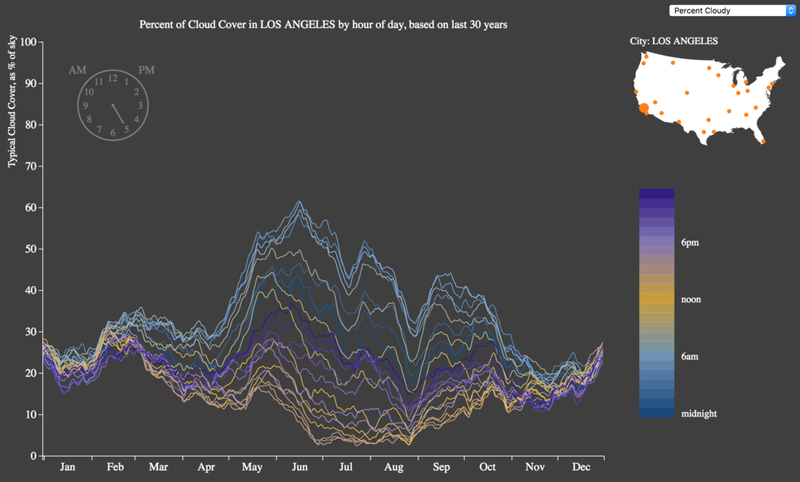 Each line shows the typical temperature (or cloudiness, or wind speed), for all 365 days of the year. The small map allows users to select from 25 cities across the United States. In this version, there are 365 lines, one for each day of the year. Each one shows the temperature (or cloudiness, or wind speed) as a distance from the center for the circle for the 24 hours of the day.